Poetry. Literary Nonfiction. Essay. In thirty innovative essays, THE POEM'S COUNTRY: PLACE & POETIC PRACTICE considers how the question of place shapes contemporary poetry. Responding from cities and rural communities across the United States, the contributors of THE POEM'S COUNTRY thoughtfully and passionately explore issues of politics, personal identity, ecology, the Internet, war, sexuality, faith, and the imagination. 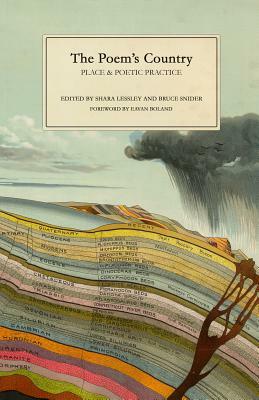 Essential reading for students of poetry at every level, THE POEM'S COUNTRY examines the connection between lyric and geographical constraint, as well as how place challenges, enchants, and helps clarify the intersections between language and the world. "THE POEM'S COUNTRY demonstrates that poetry isn't limited to the landscapes we inhabit but by the scope of the imagination itself. In these ravishing essays, the next generation of poets explores the influence of place on contemporary poetry, and a diverse reimagining of place emerges that both grounds and lifts us up." --Quan Barry.